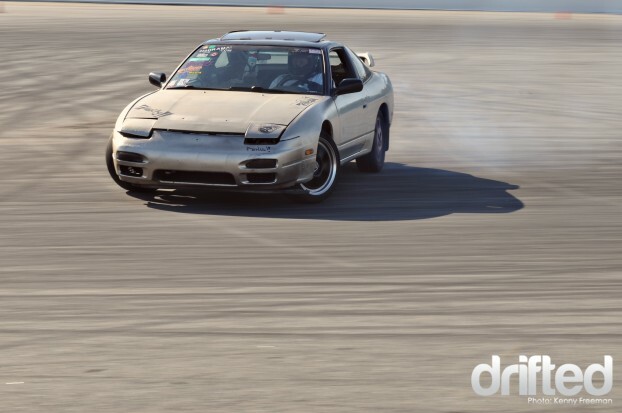 First of all let me introduce Dirty South Drift, or as we call it DSD. 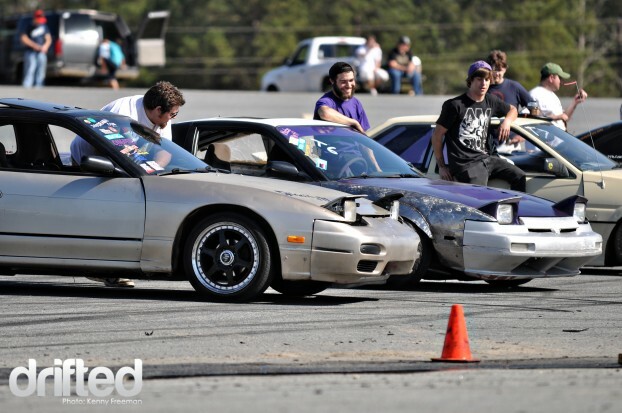 Atlanta is kinda slack on the drift series events right now, so when I came up with the idea to start one up I didn’t have any issues getting support. As I started talking to people and had some of my crew start talking we ended up getting a few sponsors right of the bat. 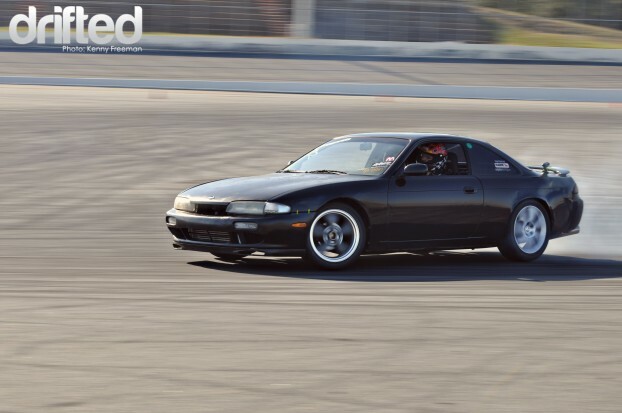 Pulling NOS Energy Drink, OMG Drift, S3 Mag and of course Drifted. After we got a few sponsors we then made it a point to keep the cost down but still be able to give out some kind of prize to the top 3 drivers. As the drivers lined up for the top 8 and great battle for first smoke was still in the air. These guys had already put on a show, driving for 6 hours and burning tires all day long, they still wanted more. 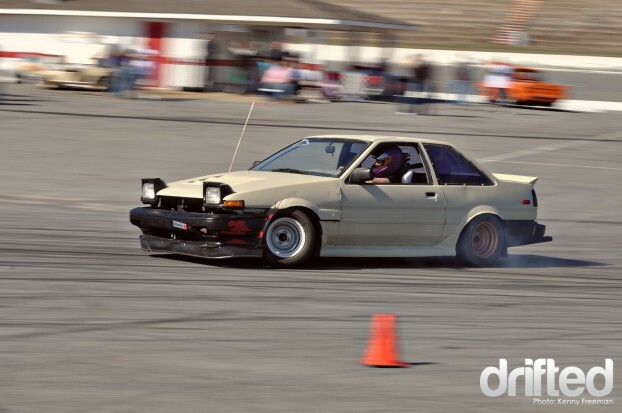 Michael Westies Lindsey driving hard in his daily driver like he always does. 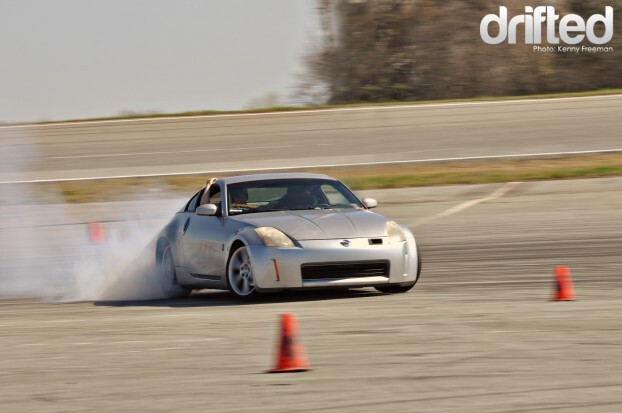 One of the staff with DSD just couldn’t help getting his 350Z smoking some. This car was driven down and driven back from the event. Miles Gunther is one of those guys that just wants to drive, he doesnt care where, when or even how sometimes. 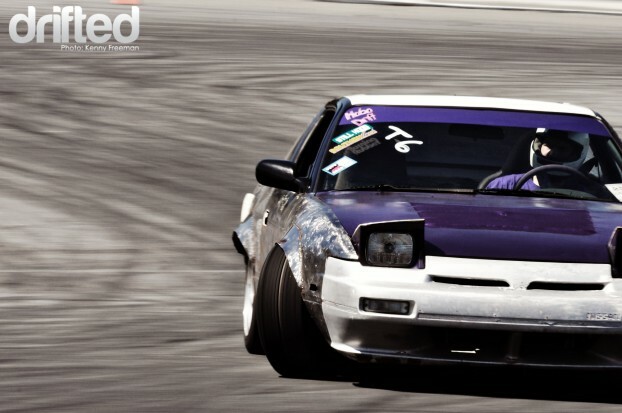 With a car like his one of a kind extreme rolled fenders and purple paint it doesn’t make it easy to miss this thing. 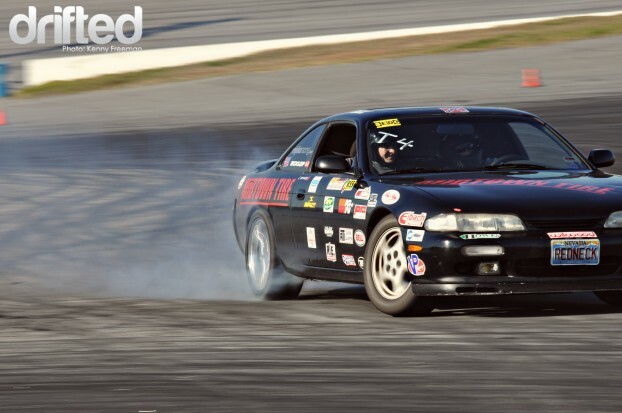 Seth Jones didnt just come out with his LS1 powered S14, he also let Stephan Gutman drive his car in the Top 8 as another driver and his tire shop Midtown Tires also sponsored the event. Look for good things with Seth, he has a great car, good attitude and a willing to drive as much as he can. J.J. Alfano had to wash off after attempting to replace his clutch before the qualifying ended. Sad to say he didn’t make it but didn’t make it out without something as you can see, as Alex Youe soaks him down. Too far??? Nicholas Frisky Walrus Hart always has fun when hes out on the track, and this time took on Alex Youe battling for 3rd but came up short. Frisky also is one of my staff that helped out with getting this event together. He kind of got thrown into the qualifying runs and surprised everyone when he took home 4th. Alex Youe sliding into 3rd place. After Sean Morgan with The Turbo Dave crew, Team Ginger Beard, took out Miles, he then went on to slide side by side with Howard Smith for first place. Thanks Sean for rocking the KPFphotography logo, Turbo Dave#s crew is a sponsored by my photography and video work. 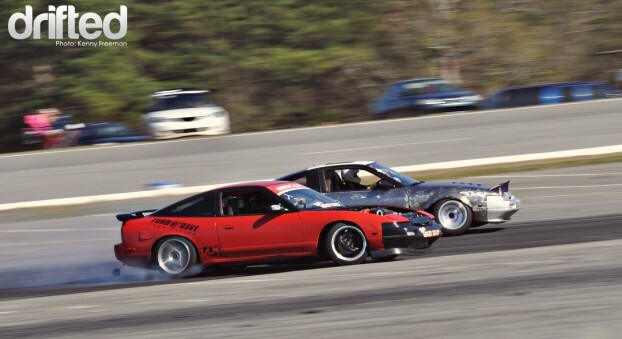 Its always good to see one of your crew tearing it up and shredding tires with your logo flying by you. Howard had been driving so smooth all day and like always loved to be out there putting on a show. Howard chasing down Sean for first in the final run of the day, Sean ended up becoming the first winner of the DSD series of 2011. Driving like this all day and actually breaking an axle in the final rounds is the reason he ended up in 1st at the end of the day. 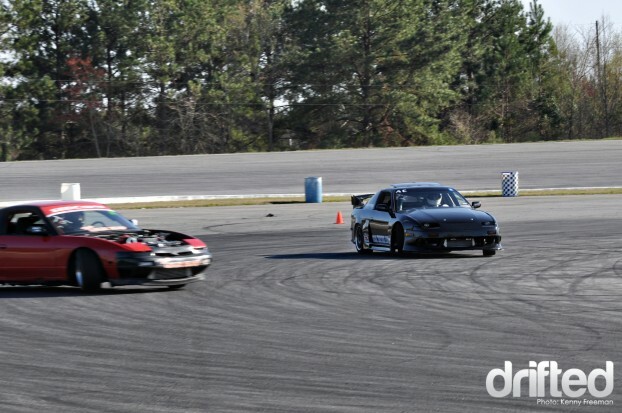 Sean Morgan with be represented at Formula Drift Atlanta with KPFphotography and Drifted by having a driver feature video made at the Pro Am event. 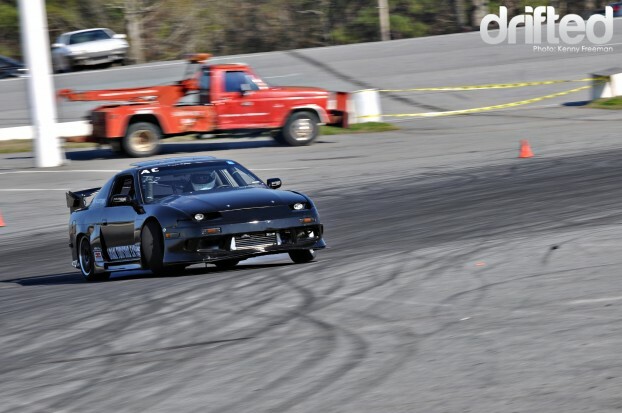 Look for this video shortly after the Formula Drift Atlanta event May 6th and 7th. 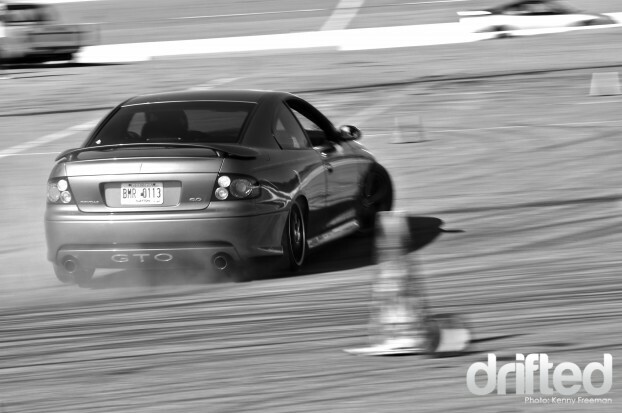 Also stay in touch to see more great drifting from all the guys plus more when the DSD series continues in the summer. Thanks to all of the DSD sponsors and anyone who helped out to make this event possible. There are too many people to name everyone but to name a few, Nicholas Hart for doing anything I really asked him to do, Uriah Cox for being my go to guy, Bryant Rosser for helping out with the planning and shooting some great photos with OMG Drift and Robert Graham for shooting some of the photos that you see above and doing a great job at it.